Dominic Solanke has made yet another significant stride in what has been an impressive year on the international stage for the Liverpool prospect. The striker has been called up to Gareth Southgate’s England squad for Tuesday’s friendly against Brazil, just days after scoring for the U21s in a 2-0 European Championship qualifier win over Ukraine. Solanke will join up with club teammate Joe Gomez, who was handed a surprise debut in Friday’s friendly against Germany when he replaced the injured Phil Jones in the 25th minute. Feel blessed and honoured being called up to the @england senior squad! Thanks for all the messages🦁🦁🦁. Solanke marks one of many experimental players Southgate has rewarded with a call-up in the absence of several injured key players. It remains to be seen whether he’ll be given a run-out at Wembley, although there is a strong possibility when considering England’s shortage of attacking options. The 20-year-old’s lack of game time for Liverpool has, understandably, seen his inclusion raise eyebrows, but it’s worth remembering just how prominent he has been in the youth setup over the last few months. 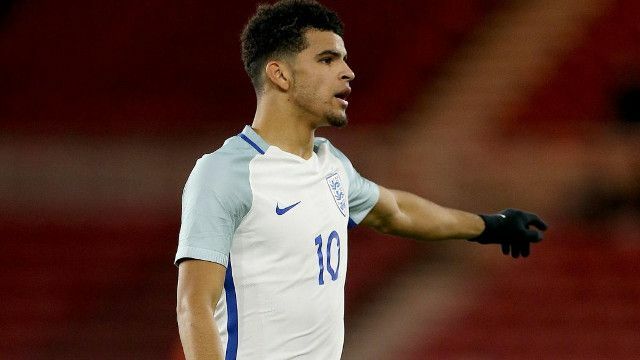 Solanke played an influential role in leading England to U20 World Cup glory in the summer, earning the Golden Ball award as the tournament’s best player. He arrived at Liverpool shortly after in similarly strong form and caught the eye with a series of impressive pre-season performances. The former Chelsea man has since been handed a place in Aidy Boothroyd’s England U21s side and quickly established himself as a key focal point. A deserved reward for a man highly-regarded by Jurgen Klopp.